The purpose of this review is to elucidate the recent developments in the diagnostic armamentarium and the treatment strategy of CMV endotheliitis. CMV endotheliitis is now increasingly recognized entity especially in the Asian population. The exact pathogenesis is still unknown but many risk factors have been identified. A strong suspicion based on clinical features with the use of modern diagnostic tools like PCR and high resolution imaging modalities can lead to early confirmation of the disease. Early diagnosis and appropriate treatment at the initial stage are crucial to avoid the sequelae. Apart from the typical clinical features, any patient presenting with KPs, raised IOP with mild AC reaction especially following corneal transplant, diagnosis of CMV endotheliitis should be considered. CMV endotheliitis can mimic graft rejection. PCR can help confirm but clinical acumen still remains the mainstay tool for diagnosis. Oral valganciclovir is the definitive treatment till date but recurrences are common. Future studies to find the appropriate dosage, duration, and the route of ganciclovir administration for prophylaxis are needed. •• da Costa Paula C, Gore D, Shah K, Kuit G, Angunawela R, Barnett J, et al. Cytomegalovirus infection is not a major cause of corneal graft failure in the United Kingdom. Eye (Lond). 2019. https://doi.org/10.1038/s41433-018-0331-9. 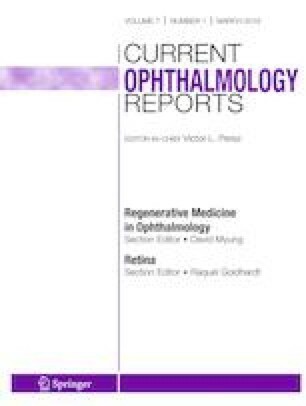 The authors looked for the presence of CMV DNA in the failed cornea graft and the donor corneal rims. No CMV could be identified and they concluded that CMV is not a significant risk factor for graft failure in UK and so do not suggest the change in the current practice patter where aqueous PCR analysis for CMV is not routinely done in UK. Hsiao C, Hwang Y, Chuang W, Ma D, Yeh L, Chen S, et al. Prevalence and clinical consequences of cytomegalovirus DNA in the aqueous humour and corneal transplants. Br J Ophthalmol. 2018:bjophthalmol-2018-312196. https://doi.org/10.1136/bjophthalmol-2018-312196.